Found this great whisky at The Pot Still in Glasgow. A closed distillery and it is from my birth year, so what is not to be excited about? Light dried fruits with a hint of freshly cutted grass in the smell. You also get some vanilla from the cask. Lovely powerful and spicy taste with lots of sherry influence. The finish is a nice continuation and for a whisky at 43 % it actually stays for a long time pampering your mouth. If the strength had been a bit more powerful (46 % would have done the trick), the finish would have been much better. 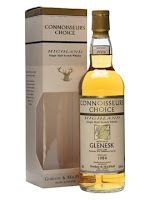 It is still good and powerful in the taste though, and I really enjoy the old map label series from Connoisseurs Choice from Gordon & MacPhail! I will rate this 90/100 (22/23/22/23).